I clicked on The Herd, but got the dreaded 404 message at each instance as noted in your piece. Thank you to you and Jerry, I just got to a place today where I could fix that link so it should be good to go now! And your’e welcome re. your blog – don’t know why I haven’t mentioned it before! Your food pics always make me hungry! The link to “The-herd” in the heading works, but the two in the text don’t work. You left a dash out. Change the link from Theherd to the-herd. In other words, add a dash between the and herd in the text links and they will work. You mentioned, “Getting through the day.” I know with depression, that can be a problem, but maybe try thinking about all of the things you can do with your time. I always have way more things I want to do in a day than I can get done. I think of life kind of like riding a bicycle. As long as you’re moving and trying to go somewhere, you don’t have any problem maintaining your balance. It’s when you stop moving and stop trying to reach a goal that it’s hard to maintain your balance. Remember that Meriwether Lewis (of Lewis and Clark fame) didn’t have much problem with his depression for 2+ years as long as he was on a journey with a mission. But when he returned and didn’t have a mission, he committed suicide. It’s important to stay on a mission. I think you have that mission now. Jerry, lately, I think of all the things I can do in a day and I’m excited and wondering how to get it all done! That, my friend, really is a good, good thing. And I think you are completely right and think my friend Dan would heartily agree with you. I’m on a mission. I definitely always need one to work on. Btw, I had no idea about Meriwether Lewis! Loved the pics of “The Herd”. Our Wally loves to do what Max does, roll over on the side and back. He then wiggle and pulls himself along!! Lake Powell pic is beautiful! Be well! AW…that’s so awesome! I know when they sit on their backs like that, they are very relaxed and happy where they are. 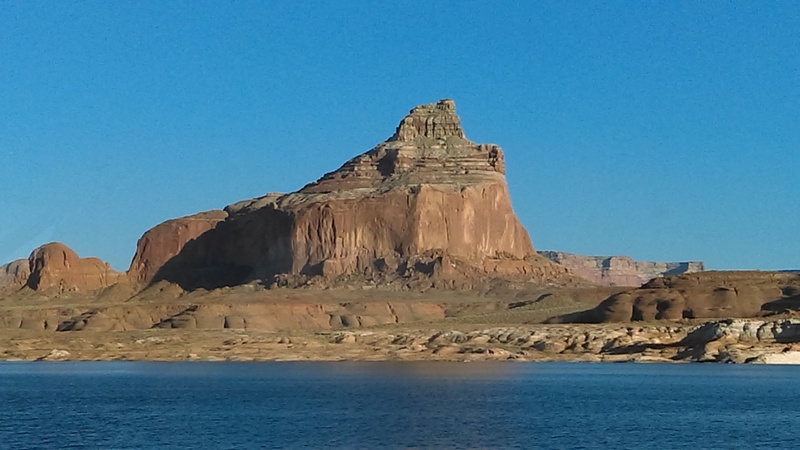 And yes, Lake Powell is beautiful, just way too remote!